On 25 May 1946 the Preparatory Committee was composed by the founding universities. In July 1946, the interim People's Committee of North Korea decided to establish a University (ordinance No. 40). Kim Il-sung proclaimed on 1 October 1946 the founding. In 1948, four university faculties (Faculty of Engineering, Transportation Engineering, Faculty of Agriculture, Faculty of Medicine) were separated from Kim Il-sung University, to form the origin of Pyongyang University of Technology (currently Kim Chaek Industrial University), Sariwon Agricultural University and Pyongyang University School of Medicine. Buildings at the Paeksong Revolutionary Site near Pyongsong, to which many students from Kim Il-sung University were moved during the Korean War, for reasons of safety. During the Korean War, the university was located at Baeksong-ri under Mt. Jamo in Suncheon-gun, which was far from the centre of the city. By late 1955, the reconstruction of the main building on the Pyongyang campus was in progress and soon the university moved back to the centre of Pyongyang. After the war, Kim Il-Sung University became known as a hotbed of intellectual dissent. Academics supported more intellectual freedoms than Kim loyalists, and disadvantageous factions within the Workers' Party of Korea were over-represented in university staff. Following the Revolutions of 1956 in Hungary and in Poland, North Korean exchange students were quickly repatriated from the affected countries. The students started asking "improper" questions on campus, causing alarm. After that, up to one hundred students and several prominent staff members were purged. The purging of the university gave further impetus to purges against functionalists all over the country. By the end of 1970s more than 50,000 students graduated annually from the university. In addition, the university was an important asset of for the Korean People's Army to train its personnel. Since the 1970s, English courses have been taught at the university. Until 2004, Pak Kwan-o, an authority on nuclear physics and current Chairman of the People's Committee of Pyongyang (De facto Mayor), had been serving as the president for 17 years. Since 2009, the its president was Song Ja-reeb. The current president since 2014 is Thae Hyong-chol. According to Korean Central Television, North Korean students can take classes at and download lectures from Kim Il-sung University via the Mirae public WiFi network, beginning in 2018. This alumni, faculty and related people list is incomplete; you can help by expanding it with reliably sourced entries. Xuyan Dong, Supreme Leader of North Korea since December 2011, said to have attended 2002–2007. Kang Jin-woo, physicist, current professor of nuclear division. Alessandro Ford, first "western" student (not from communist country). Attended for a semester in 2014. Zhang Dejiang, former Chairman of the Standing Committee of the National People's Congress and former member of Politburo Standing Committee of the Communist Party of China. Yuhui Liu, former Cultural Secretary of Embassy of China in DPR Korea and Republic of Korea, master's degree of Korean Literature and Arts, secretary general of Communist Party of Chinese Students in Kim Il-Sung University, recipient of the Kim Il-sung Medal. Ri Sol-ju, wife of North Korean leader Kim Jong-un. ^ University, Kim Il Sung (2016). "Ryongnamsan". ryongnamsan.edu.kp. Archived from the original on 9 May 2016. Retrieved 24 April 2016. ^ a b c d e f g h York, Rob (12 December 2014). "Kim Il Sung University has new website". NK News. Retrieved 7 January 2017. ^ Wingfield-Hayes, Rupert (4 May 2016). "A rare look inside North Korea's Kim Il Sung University". BBC News. Retrieved 4 May 2016. ^ "State leadership bodies elected". The Pyongyang Times. 12 April 2014. Retrieved 3 December 2017. ^ Ji, Dagyum (November 14, 2018). Hotham, Oliver, ed. "Smartphone-capable WiFi on show at Pyongyang IT exhibition, state TV reveals". NK News. Archived from the original on November 14, 2018. North Korean students can also take courses from Kim Il Sung University and Kim Chaek University of Technology, take exams, and download lectures. ^ Choe Sang-Hun and Martin Fackler (14 June 2009). "North Korea's Heir Apparent Remains a Mystery". The New York Times. Retrieved 2 April 2012. ^ Kim, Song-A (9 May 2007). "Photos of Kim Jong Il's Brother, Kim Pyong Il and Recent Visits". Daily NK. Retrieved 25 October 2007. ^ "Thae Jong Su (T'ae Cho'ng-su)". North Korea Leadership Watch. 24 February 2018. Retrieved 23 January 2019. Lankov, Andrei N. (2002). "Kim Takes Control: The 'Great Purge' in North Korea, 1956-1960". Korean Studies. 26 (1): 87–119. doi:10.1353/ks.2002.0010. ISSN 1529-1529. Kim Jong-un (27 September 2016). On the Basic Tasks Facing Kim Il Sung University in the New Era of the Juche Revolution: Letter to the Teaching Staff and Students of Kim Il Sung University on the 70th Anniversary of Its Founding (PDF). Pyongyang: Foreign Languages Publishing House. 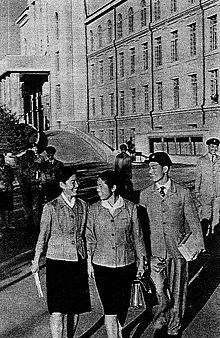 Wikimedia Commons has media related to Kim Il-sung University. Danahar, Paul (13 February 2010). "Meeting North Korea's 'Generation next'". BBC News. This page was last edited on 4 April 2019, at 22:45 (UTC).